Brazilian city and seaport; capital of the state of Pernambuco. It was merely a collection of fishermen's huts when occupied by the French in 1561. Shortly afterward, however, it began to attract attention as a port. Both Recife and the neighboring town of Olinda were captured by the Dutch under Admiral Loneq in 1631. Thereafter Recife became one of the most important strongholds of the Dutch in Brazil. 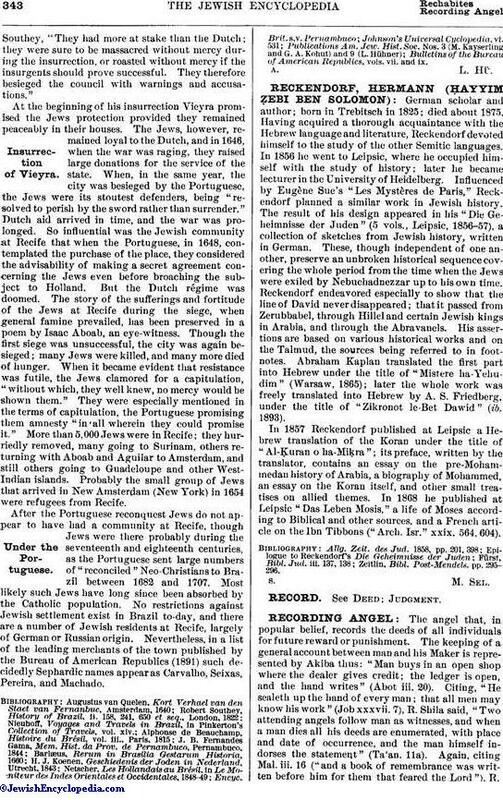 The liberal policy of the Dutch induced many Jews and Neo-Christians to remove thither from other parts of Brazil, and soon Recife had a large Jewish population. It is described by Portuguese writers as being chiefly inhabited by Jews, who by 1639 had the trade of the city practically in their own hands; and in a work published at Amsterdam in 1640 they are stated to have been twice us numerous there as Christians. They were permitted to observe their Sabbath. The importance of the city increased during the wars between the Dutch and the Portuguese. Anxious to make it the foremost city of their possessions, the Dutch endeavored to attract colonists from abroad, and appealed to Holland for craftsmen of all kinds. In response many Portuguese Jews left Holland for Recife, induced to do so not only by pecuniary considerations and the advantage of the free exercise of their religion, but doubtless by a preference for a community in which the Spanish and Portuguese tongues were spoken. Within a few years the Jews at Recife numbered thousands, and one of them, Gaspar Diaz Ferreira, was considered one of the richest men in the country. Nieuhoff, the traveler, writing in 1640, says: "Among the free inhabitants of Brazil the Jews are most considerable in number; they have a vast traffic, beyond all the rest; they purchased sugar-mills and bought stately houses in the Receif." 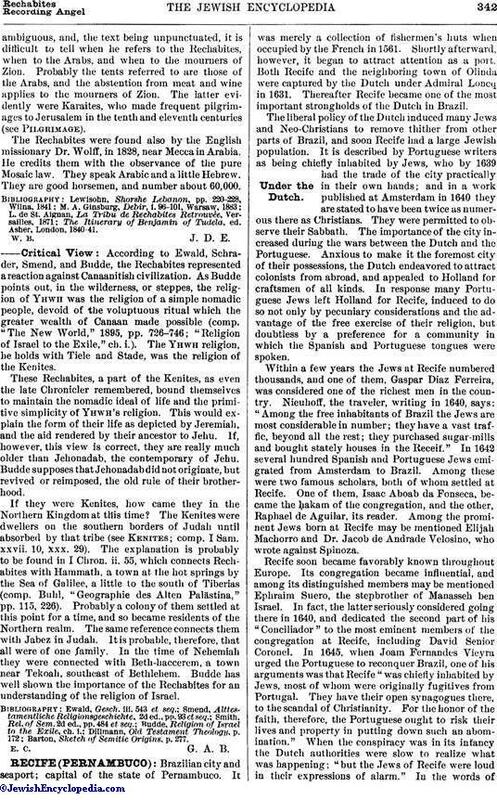 In 1642 several hundred Spanish and Portuguese Jews emigrated from Amsterdam to Brazil. Among these were two famous scholars, both of whom settled at Recife. One of them, Isaac Aboab da Fonseca, became the ḥakam of the congregation, and the other, Raphael de Aguilar, its reader. Among the prominent Jews born at Recife may be mentioned Elijah Machorro and Dr. Jacob de Andrade Velosino, who wrote against Spinoza. Recife soon became favorably known throughout Europe. Its congregation became influential, and among its distinguished members may be mentioned Ephraim Suero, the stepbrother of Manasseh ben Israel. In fact, the latter seriously considered going there in 1640, and dedicated the second part of his "Conciliador" to the most eminent members of the congregation at Recife, including David Senior Coronel. In 1645, when Joam Fernandes Vieyra urged the Portuguese to reconquer Brazil, one of his arguments was that Recife "was chiefly inhabited by Jews, most of whom were originally fugitives from Portugal. They have their open synagogues there, to the scandal of Christianity. For the honor of the faith, therefore, the Portuguese ought to risk their lives and property in putting down such an abomination." When the conspiracy was in its infancy the Dutch authorities were slow to realize what was happening; "but the Jews of Recife were loud in their expressions of alarm." In the words ofSouthey, "They had more at stake than the Dutch; they were sure to be massacred without mercy during the insurrection, or roasted without mercy if the insurgents should prove successful. They therefore besieged the council with warnings and accusations." At the beginning of his insurrection Vieyra promised the Jews protection provided they remained peaceably in their houses. The Jews, however, remained loyal to the Dutch, and in 1646, when the war was raging, they raised large donations for the service of the state. When, in the same year, the city was besieged by the Portuguese, the Jews were its stoutest defenders, being "resolved to perish by the sword rather than surrender." Dutch aid arrived in time, and the war was prolonged. So influential was the Jewish community at Recife that when the Portuguese, in 1648, contemplated the purchase of the place, they considered the advisability of making a secret agreement concerning the Jews even before broaching the subject to Holland. But the Dutch régime was doomed. The story of the sufferings and fortitude of the Jews at Recife during the siege, when general famine prevailed, has been preserved in a poem by Isaac Aboab, an eye-witness. Though the first siege was unsuccessful, the city was again besieged; many Jews were killed, and many more died of hunger. When it became evident that resistance was futile, the Jews clamored for a capitulation, "without which, they well knew, no mercy would be shown them." They were especially mentioned in the terms of capitulation, the Portuguese promising them amnesty "in all wherein they could promise it." More than 5,000 Jews were in Recife; they hurriedly removed, many going to Surinam, others returning with Aboab and Aguilar to Amsterdam, and still others going to Guadeloupe and other West-Indian islands. Probably the small group of Jews that arrived in New Amsterdam (New York) in 1654 were refugees from Recife. After the Portuguese reconquest Jews do not appear to have had a community at Recife, though Jews were there probably during the seventeenth and eighteenth centuries, as the Portuguese sent large numbers of "reconciled" Neo-Christians to Brazil between 1682 and 1707. Most likely such Jews have long since been absorbed by the Catholic population. No restrictions against Jewish settlement exist in Brazil to-day, and there are a number of Jewish residents at Recife, largely of German or Russian origin. Nevertheless, in a list of the leading merchants of the town published by the Bureau of American Republics (1891) such decidedly Sephardic names appear as Carvalho, Seixas, Pereira, and Machado. Bulletins of the Bureau of American Republics, vols. vii. and ix.